Let our friendly and knowledgeable sales team help you find the right tile floor for your home or business. Our staff members continually strive to meet and exceed our customers’ expectations. With our huge selection of porcelain and ceramic, you are sure to find the ideal tile products that meet all of your needs. The products we sell deliver the best performance at the best possible price. Visit our flooring store today and feel free to browse our aisles, which are filled with examples and displays of our popular ceramic, slate, and porcelain tile options. Once you have made your purchase, you can also take advantage of our tile flooring installation services. We will work with you throughout the whole process -- from selection to measuring to installation. At every step of the way, we aim for 100% customer satisfaction. Let us answer any questions you have about ceramic tile. Our knowledgeable and friendly sales staff is happy to help you decide if ceramic is the right fit for your home or business. Used for floor and wall coverings, this type of tile is a sensible choice for any property. It combines beauty and durability with stain resistance, which results in one stylish and practical package. Resistant to moisture and abrasion, this type of tile is durable enough to withstand the wear and tear of heavy daily traffic. You can easily maintain it; because it is resistant to both stains and chemicals. Just sweep or vacuum and wash the tile on a regular basis to keep them looking brand new. Ceramic tile is an ideal choice for kitchens and bathrooms. When properly sealed, the surface of the tile is impervious to water, so splashes and spills are no problem. Tiles are great for floors, walls, countertops, or entire shower units. They are modular by design and come in a huge variety of colors and styles, so you can create a virtually infinite variety of designs. With so many patterns and color choices to choose from, your imagination is the only limit. You can improve both the value of your home and the appearance of your rooms with our beautiful and strong porcelain tile options. Porcelain is a type of ceramic that is made from finer, denser clay and fired at hotter temperatures. The result is an extremely strong, hard tile that is popular for use in high-end bathrooms and kitchens. Since this material is so dense, porcelain tile resists all types of stains and harm from frost and cleaning agents. In addition, this kind of tile resists fading and staining, and it remains easy to clean because of its low water absorption rate. Porcelain is very heavy and extremely hard, so it is more complex to cut and install than other forms of ceramic. Installation requires specialized training and equipment. Our installation team has the skill and experience to achieve stunning results every time. We have installed hundreds of porcelain floors and walls for customers throughout the region and have an excellent track record. 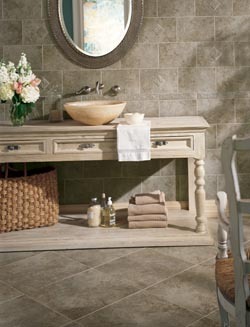 Slate tile is a natural material that is both durable and beautiful. This type of tile adds elegance and refinement to any kitchen or bathroom. Installing slate can be challenging, but our installation team is up to the task – and the results are well worth it! Slate comes in a variety of colors and finishes; and it features natural grain that creates gorgeous patterns. You can achieve a huge range of designs using this material. Our high-quality slate tile is treated and sealed to make it waterproof and resistant to stains. One of the major advantages of slate is that it retains heat well. Stepping out of the shower or bathtub onto a warm slate floor is a treat for the feet. At our flooring showroom, we not only provide a wide range of tile options for you to choose from, but we also provide professional tile flooring installation. As a local flooring source with years of experience, we have the experience and tools necessary to save you time and money on installation. We serve both residential and commercial customers throughout the region and have a reputation for delivering great results. Choosing the right type of tile for your home can feel overwhelming. With so many materials, colors, and patterns to choose from, it can be hard to know where to start. Our sales team is here to help you select a flooring material that will work perfectly in your home. Whether you’re remodeling your bathroom or designing tile floors for a new construction, we’ll make sure you walk out with great products at fair prices. We built our business on word-of-mouth referrals and repeat customers, so our goal is to make sure you are completely satisfied with your new tile floors. If you need any help coming up with ideas, don’t hesitate to ask. We’re always happy to introduce customers to new products and make suggestions. Our employees have a wealth of experience in the flooring industry, and we always keep up to date with the latest developments and trends. Contact us today for high-quality ceramic and porcelain tile for your home or office. We proudly serve the communities of Seaside, Astoria, Cannon Beach, and Manzanita, Oregon, as well as on the Long Beac peninsula.